Note: Please note that this tutorial is for WRL-15031. If you are using SPX-15000, please refer to this tutorial. With the advent of WiFi-connected "smart" devices, IR remotes are quickly becoming a thing of the past. Why sort through a coffee table-full of remotes when you probably have a much smarter, WiFi-connected device device sitting conveniently in your hand? The WiFi IR Blaster is designed to connect all of those old, legacy IR-controlled devices to a WiFi network -- exposing them to a new method of control. Want to control your TV via a web-browser? Want to ask Alexa to mute your stereo? Want to schedule triggers to your IR-controlled LED strip? These are all applications that the WiFi IR Blaster is perfect for. The WiFi IR Blaster combines an ESP8266 -- a powerful WiFi/microcontroller SoC -- with IR emitters and receivers. With built-in WiFi support, the ESP8266 can be programmed to provide an interface between HTTP, MQTT, TCP, etc. and infrared-controlled devices. This tutorial will explain how to assemble the WiFi IR Blaster and it will detail how to program the ESP8266 using the Arduino IDE. Once complete, you'll have a simple web server than can emit infrared signals at the click of a browser-page. 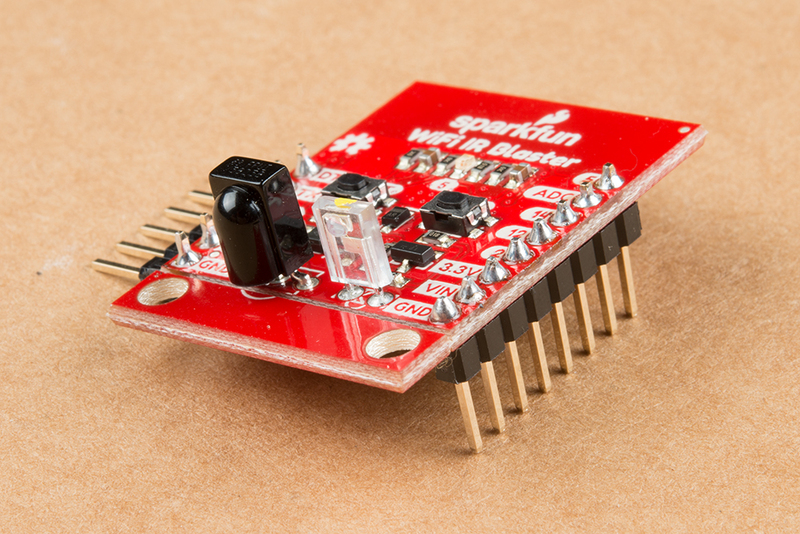 The SparkFun Beefy 3 - FTDI Basic Breakout is primarily used to program the ESP8266, but it's also able to supply the 3.3V/300mA power required by the Blaster. Although you can use any 3.3V USB-to-serial converter, this is the one we recommend. Headers -- either right-angle or straight are the recommended interface between your board, the programmer, a breadboard, perfboard, etc. If you don't have an IR remote handy, the SparkFun IR RemoteControl is a useful tool for testing. It may even accidentally work with your TV! In addition to those components, you'll need a soldering iron, solder, and general soldering accessories. To add, you'll also need a local WiFi network that you can connect your ESP8266 up to. It also helps to have a second device -- smartphone or computer -- that's also connected to that network. 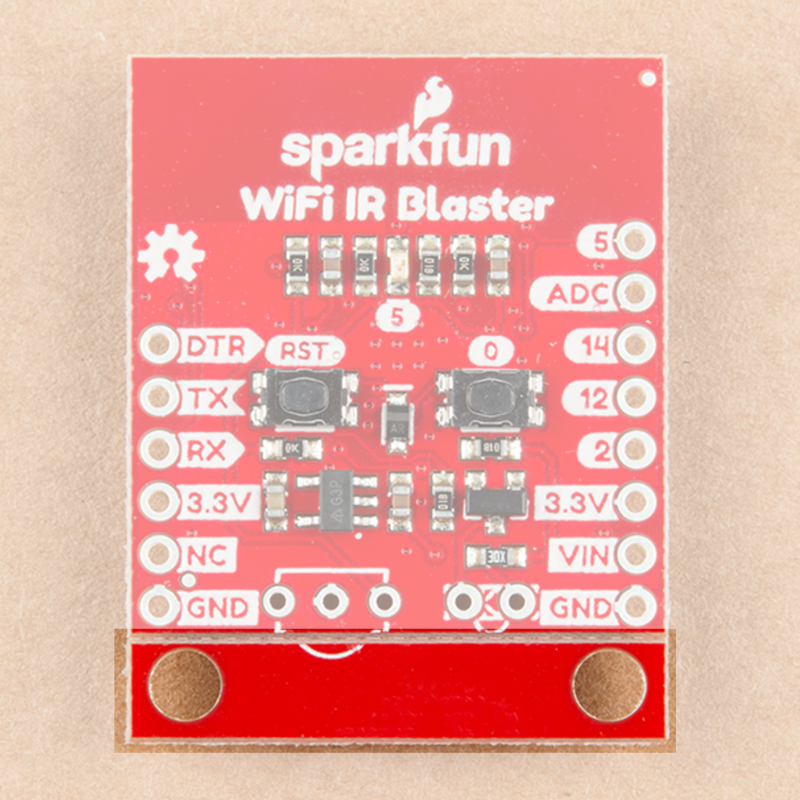 The WiFi IR Blaster is based around the ESP-12S ESP8266 module. This module equips the ESP8266 with a crystal, 4Mb flash, and PCB antenna -- just about everything it needs to get going. The antenna sits under the SparkFun logo, so try not to place anything that may interfere with WiFi signals near that area. 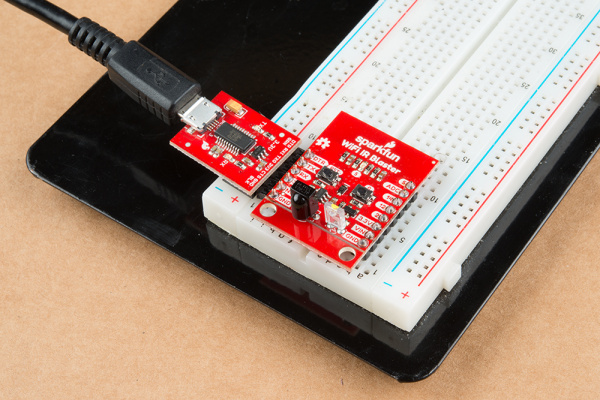 Supporting the ESP8266 are a reset and general purpose button, a user LED, and an array of pin breakouts. Of course, there's also the IR emitter and detector. These components are packaged with the board, but not soldered in place. This allows you to solder both components at any angle your project requires. It also leaves the option to customize the board and spec out your own emitter and/or receiver. 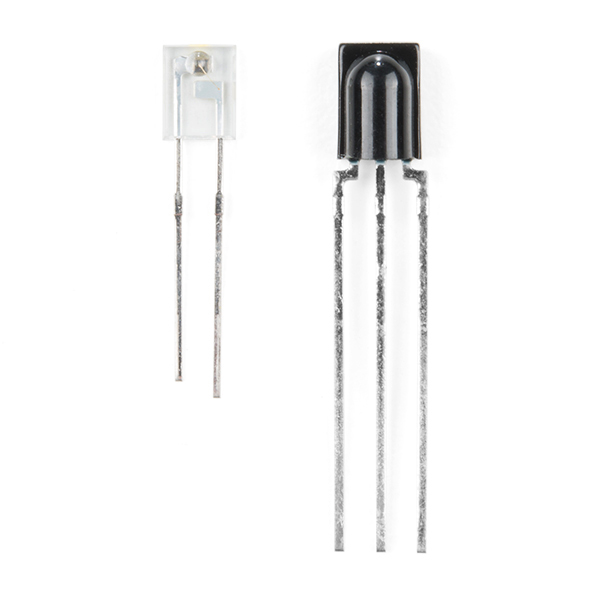 The IR emitter is a Lite-ON LTE-302. It's driven by an NPN transistor, which helps amplify the current through the LED. The IR receiver is a TSOP38238. This is a simple IR receiver hard-coded to receive IR signals modulated at 38kHz. Time to whip out a soldering iron! The IR emitter and receiver do not come soldered onto the WiFi IR Blaster. You'll also need to solder headers for programming and power supply pins. Please note: Both IR components are polarized -- make sure you solder them in in the correct orientation. Both components have a bulb-shaped bump protruding from one side, the bumps should both be facing towards the nearer edge of the board. Silkscreen on the board should also help orient the components. While you have your iron out, you may also want to solder headers into the 6-pin serial header and the 8-pin power/GPIO header. Which headers you solder into the board ultimately depends on your application. I like soldering in a male right-angle header to the 6-pin header, which makes attaching the USB-to-serial board easier. Straight male headers work well for plugging the board into a bread- or perf-board. 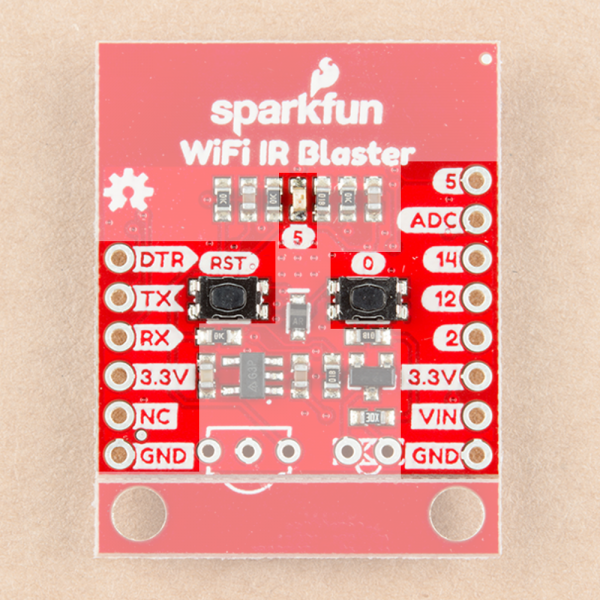 The WiFi IR Blaster includes a 3.3V low dropout regulator which can supply up to 600mA and handle voltage inputs up to 6V. To use this regulator, connect your power source to the VIN pin. Alternatively, a pair of 3.3V pins are broken out on both headers. This pin directly supplies the ESP8266, so it should remain regulated to the range of ESP8266: 3.0V-3.6V. 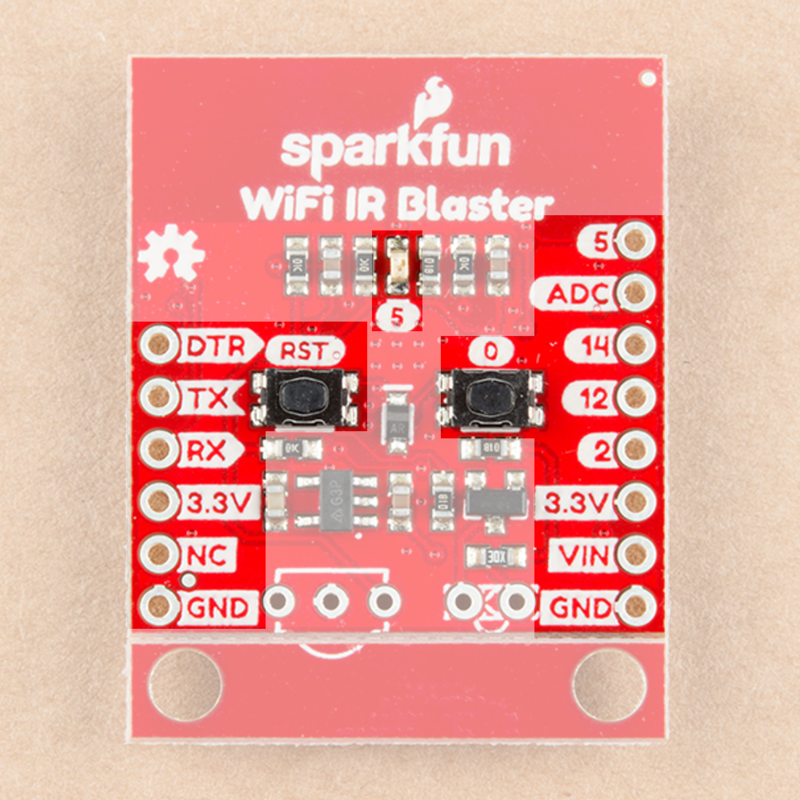 The WiFi IR Blaster can be powered via the 3.3V pin on the 6-pin serial header. Voltage supplied to this pin should be regulated to 3.3V. Your power source will need to be able to supply at least 300mA, which most FTDI boards cannot do. 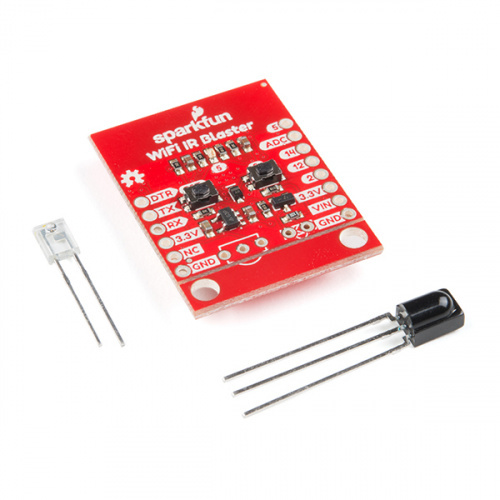 We recommend the Beefy 3 FTDI Basic Breakout which can supply up to 600mA. A pair of standoffs are provided towards the bottom of the WiFi IR Blaster. If you don't need these standoffs, and want to save some space, the standoff board can be removed by breaking it along the v-score line. 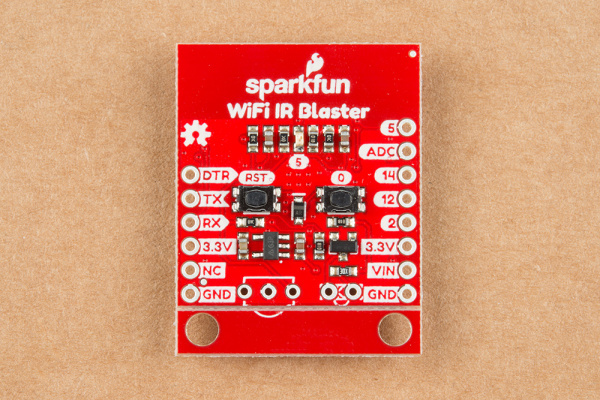 The WiFi IR Blaster's ESP8266 is designed to be programmed with a 3.3V FTDI Basic or a similar 6-pin USB-to-Serial converter. We recommend a Beefy 3 FTDI Basic Breakout if you're powering the Blaster with the FTDI (see the note in the previous section for more information). Plug your USB-to-serial converter in making sure you match the "GND" and "DTR" signals on the edge. Before programming the WiFi IR Blaster's ESP8266, you'll need to install the ESP8266 Arduino board definitions. 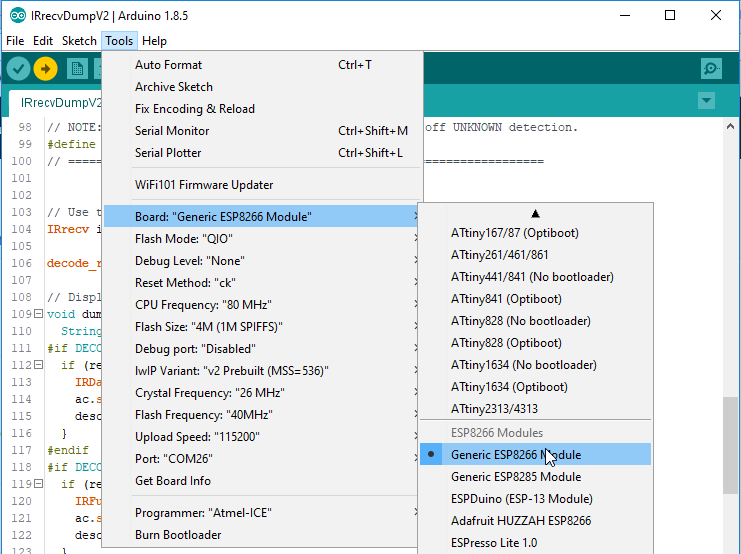 The board definitions can be found in the ESP8266 Arduino GitHub repository. For installation instructions, check out this section of the README. In addition to the RX and TX pins, the FTDI's DTR pin is used to reset the ESP8266 and get it into bootloader mode. The board includes circuitry to automatically reset and bootload the board; in most cases, you shouldn't have to do anything special to program it. The auto-reset circuit can be a little flaky, however. If the board isn't taking a program, you may see an error like "error: espcomm_upload_mem failed". The timing of this can be a little tricky. Try resetting it into bootloader mode, then quickly uploading your sketch. Decreasing the upload speed baud rate to something around 115200 bps can also help improve the reliability of the reset circuit. IRremoteESP8266 -- an IR Arduino library specific to the ESP8266 -- gets our recommendation for sending and receiving IR signals with this board. You can download the library from their GitHub page, or by searching out IRremoteESP8266 in your Arduino library manager. The IR remote library includes an exhaustive collection of examples which demonstrate how to send and receive IR signals. 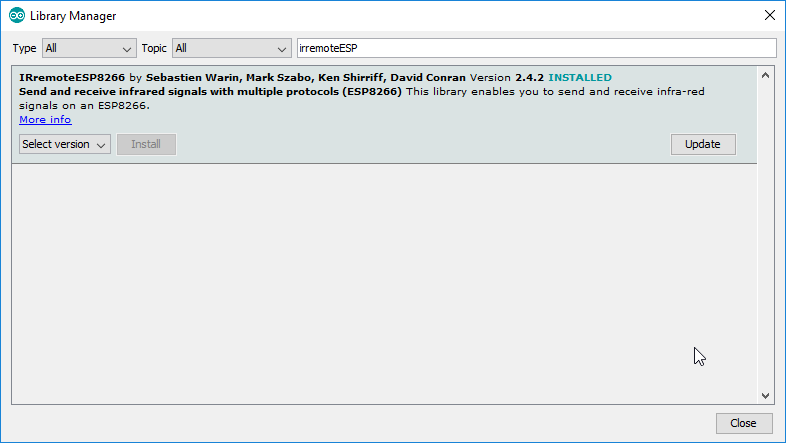 To test out the receiver, open up the IRrecvDumpV2 example by navigating to the File > Examples > Examples from Custom Libraries > IRremoteESP8266 menu. Before uploading the sketch, you need to modify the kRecvPin pin definition where global variables are defined.. This sets the ESP8266 pin connected to your IR receiver. Set it to 13. Once that modification has been made, upload away! (Make sure the board is set correctly to "NodeMCU 1.0 (ESP-12E Module)".) Then open up the serial monitor and set the baud rate to 115200. You should see a "IRrecvDumpV2 is now running and waiting for IR input on Pin 13" message print out. If you don't try tapping the board's reset button. Then aim an IR remote at the board and hit a button. You should see a stream of data shoot by. These lines will be used in the next example, where we test the emitter. 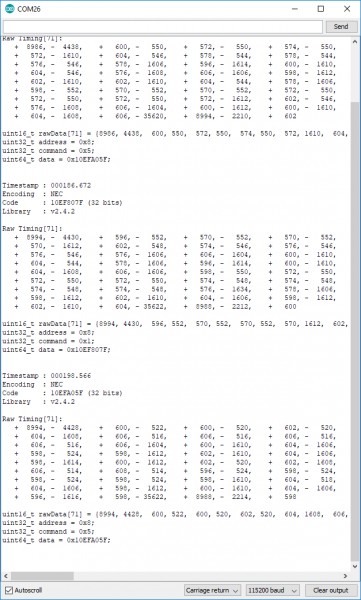 Armed with the timing data for your desired IR command, load up the IRsendDemo example. Around line 42, replace the rawData array with the one you copied from the previous example. You shouldn't have to modify the pin definition for the IR emitter -- just double-check to make sure IR_LED is set to 4, which is the ESP8266 pin connected to the IR emitter. With that change made, upload the code. Then point the IR emitter at your device. The emitter has a range of about 10 feet, so you may need to get a little close. It should receive a command every 6 seconds. If your code is Sony- or NEC-encoded, you can also plug the value from data in the previous example to send an NEC or Sony command. 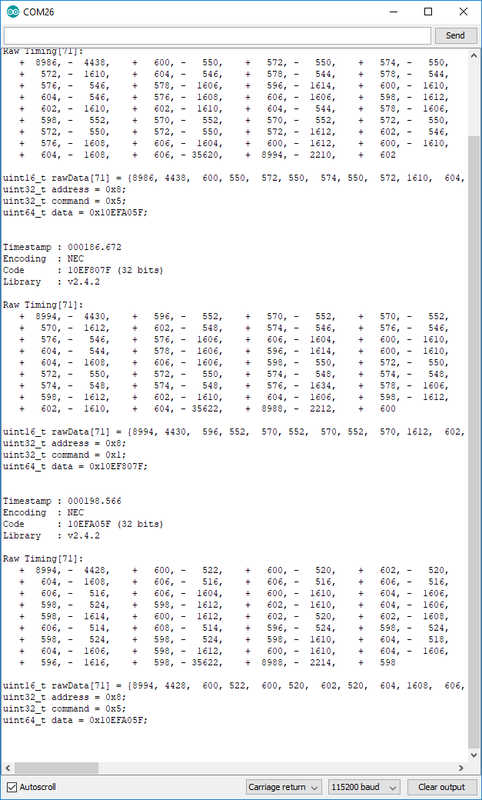 This is quite a bit more efficient than sending the raw timing data. One last example which really begins to show the power of this module is the IRServer example. 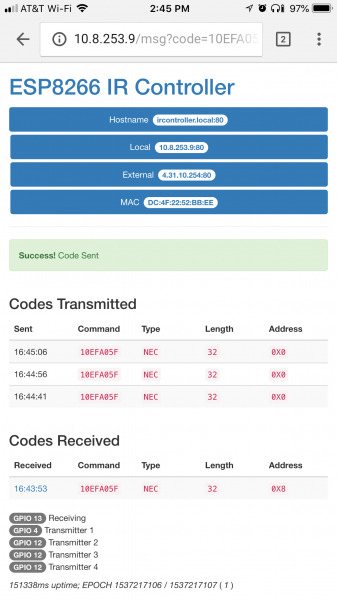 This sketch will connect your ESP8266 to WiFi and set it up as a web server. When the right HTTP endpoint is hit, it will send a desired command. So you can trigger your device from a web browser! This example requires that you have an NEC-encoded signal to send. Before uploading this example, plug your WiFi network's SSID and password into the ssid and password variables. Then upload the code! Open the serial monitor to check on your ESP8266's connection status. Once connected it should provide you an IP address. Then aim your IR Blaster at a device, and click your newly added link. Your signal should be routed from your phone or computer, over the WiFi airwaves, to the device you want to control. Exploring the IRRemoteESP8266 library is just the very tip of this WiFi IR Blaster iceberg. We highly recommend checking out the IR Controller ESP8266 firmware. This fully featured firmware combines IR send and receive functions with a web server. It monitors for received commands, and provides a handy interface to emit those back out with the ESP8266. There are even instructions for connecting the Blaster to an Alexa service. You'll also need to install a handful of libraries, which are all described in the Setup section of the README. With those few modifications, you should be up-and-IR-controlling in no time! GitHub Product Repository -- GitHub repository where you can find all of our latest hardware and software design files. Want more information or inspiration? Check out the following links!